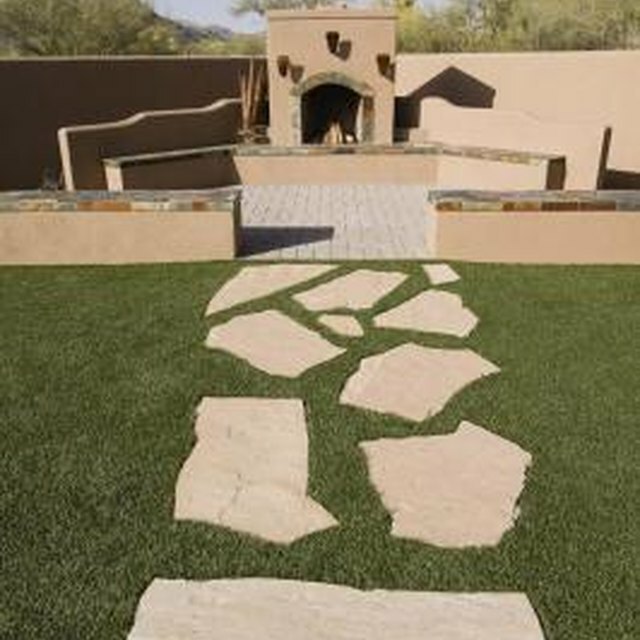 People often use flagstone to create a patio or walkway outside of buildings. The stone can also appear on the sides of buildings. Flagstone isn't one specific type of stone. It usually consists of limestone, sandstone or granite. You can purchase the stone in colors such as gray, brown or pink. When cutting flagstone, take safety precautions such as wearing protective eyewear and keeping children out of sight. Take your time when cutting so that you achieve the desired result. Cut flagstone to build an exterior wall or patio for your home. Measure with a ruler and mark with chalk where you want to cut the flagstone. Irregular flagstone pieces are also cut with this method; you just need to make more cuts. Place the plywood outside on a stable surface and lay the flagstone on top. The plywood will protect the area underneath from the masonry saw. Put on your protective eye gear and insert the ear plugs, if desired. A masonry saw spews a lot of debris and can make a lot of noise, so be careful. Try cutting during the day to avoid annoying your neighbors. Touch the masonry saw down on the chalk line you marked. Avoid pushing too hard; allow the weight of the saw to guide the movement so you avoid excess wear on the blade. Many masonry saw rental companies will charge you by the wear and tear to the blade, according to a company called The Flagstone Experts. Cut along the entire line without stopping. Stopping allows dust to settle, which can block your view. A continual cut will also appear smoother to the eye. Score the edges of the [cut flagstone with a chisel](https://homesteadycom/how-7410331-cut-flagstone-chiselhtml) if you want to roughen its edges. Hit the score marks gently with the chisel to break off small pieces. Work slowly and carefully to avoid breaking too much stone. How do I Sharpen Reamers?